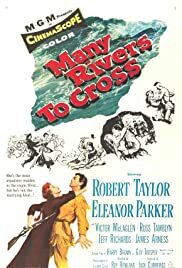 Robert Taylor and Eleanor Parker star as a Kentucky backwoodsman and the woman who will NOT let anything interfere with her plans to marry him in this humorous romantic adventure through the American Frontier of 1798. In 1883 South Dakota, two buffalo hunters start a personal feud over a captured squaw and a stand-off with a Dakota raiding party over some stolen horses. A drunken college boy invites a taxi dancer to spend the weekend at his snobbish school. The Leiningen South American cocoa plantation is threatened by a 2-mile-wide, 20-mile-long column of army ants. Eluding a sheriff's posse, an escaped man saves a farming family from a Comanche attack and escorts it to the nearby Fort Dobbs. Mary Stuart Cherne: It's just, I loved you so much... I thought you'd have to love me back. I wasn't expecting much from this film - just something to pass a rainy Sunday. What a wonderful surprise to find myself watching a screwball comedy about as good as Cary Grant or Irene Dunne could have hoped to make in the 1930's. Give it a chance - you might love it like I did.